After some time with this map, I thought I would submit it to see what my fellow Stronghold players thought. I designed this map around somewhere that holds special significance for me- the Altai Mountains of Central Asia. "Monkhbat, third son of an Altay chief, was always a fat and greedy man. Feasting excessively on bowls on milk and plates of meat, he was often the subject of jokes from his brothers for his laziness. He soon became so obese that he could not mount a horse, and barely fit into his oversize robes. Worried that Monkhbat would never be able to handle the responsibility of a clan chieftain, his father decided to put his idle son to work. He sent Monkhbat deep into the Altai Mountains, away from the comfort of his home and his mothers cooking, to be tasked with building an outpost for messengers and rural traders. Monkhbat, red faced and puffing from his journey through the forests, finally stopped at a secluded sight near a deep blue lake. Here he decided to mark the site for his settlement." I hope you enjoy. It is my first map, and I would be grateful for any reviews or comments. Nice map , scenario is easy ( 20 monthes left at VH level ) . For my taste , it is a good job for a " normal " map . Hi, i have enjoyed this nice map. If i have the time, i will write a review for this. Good work. Good playability, all events were well written. Being a fan of slow paced economic missions, i have especially enjoyed the relaxed game play. I was able to complete the entire scenario the first time, but this does not mean it was boring or too easy. For me, it was above average, but again i am a fan of easy going economic maps. A welcome change from hectic invasion maps. The author succeeds in bringing an abandoned and natural atmosphere in the mountains. Starting position of buildings and units is good. Sufficient use of wild animals provides somewhat challenge. Beautiful transition from higher ground to the lower ground near the lake with the help of gentle natural slopes. The use of the lake provides an open and great landscape as described in the story. Shortcoming use of debris and stone in the river and lake is a little inadequate here. More use of this will prove to be more realistic in your landscape. Not enough use of coils in the mountain river on the higher ground is also a bit insufficient. Not perfect, but above average design of a lake situated in the mountains. The story is adequate for this kind of mission and the instructions are comprehensive. The setting in Central Asia is original. An attractive economic mission for players who like relaxed playing. 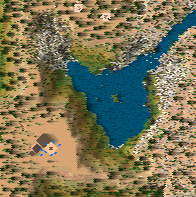 The eye candy in this map is provided by a beautiful and natural setting of the lake in a mountainous region. Downloading this map is recommended. Keep up the good work, GreatDanes. There are enough goals and events to keep a players interest throughout this mission. I did not complete it on the first attempt, and it made me want to play it again. which is the requirement of any good game. The balance of the gameplay is good, the author has scripted the events with just enough of a challenge to keep you on your toes. There are just the correct amount of resources and bad things to make your time spent here worthwhile. This,at heart,is just a plain, basic, task driven game, no new ideas or tricks are included nor required,it's aim is to be played and enjoyed and it certainly achieves that goal. The use of the scripted events are well incorporated and assist the players overall experience. The story is welcomely different from many others, set as it is in Asia, although quite short, it is a good introduction into the mission. The addition of the accompanying notes are also helpful. The author, GreatDanes, announced that this was his first attempt at map making, well, what a good job he has made of it, a well balanced, nice looking game that plays fine and should interest any new or experienced players. Maybe having an input into where I placed my Keep at the start of the mission, may have upped the games playability and longevity. Overall, well worth downloading. Nice first map GreatDanes, I enjoyed playing this game. You show a good understanding of map making and script editing,well done. Review to follow. Thanks so much to Bourgogne and Sir Realist for your wonderful and helpful reviews! I'm sorry for such a late response but my Windows recently died on me and I had to get my hands on a new computer. I'm very glad you enjoyed the map and I really appreciate the feedback you both gave. I will definitely keep it in mind for any future projects. A nice and eventful map, always keeping you busy to react upon those bad events such as fire, plagues, cow desease etc. Needed two attempts to figure out how to start and to proceed successfully ... it is well playable on all three difficulty levels, keep up the good work!